With strong transport demand management (TDM) strategies, cities can move beyond auto-dependency towards sustainable, people-oriented mobility. Photo by Dylan Passmore/Flickr. How can we tackle the challenge of traffic congestion? What is driving urban sprawl? How does public transportation relate to issues of equity? In the following interview, TheCityFix sat down with Todd Litman, Founder and Executive Director of the Victoria Transport Policy Institute, to discuss his thinking on these questions, and how cities can move beyond costly car-oriented development. Private vehicle ownership across the world is at an all-time high. 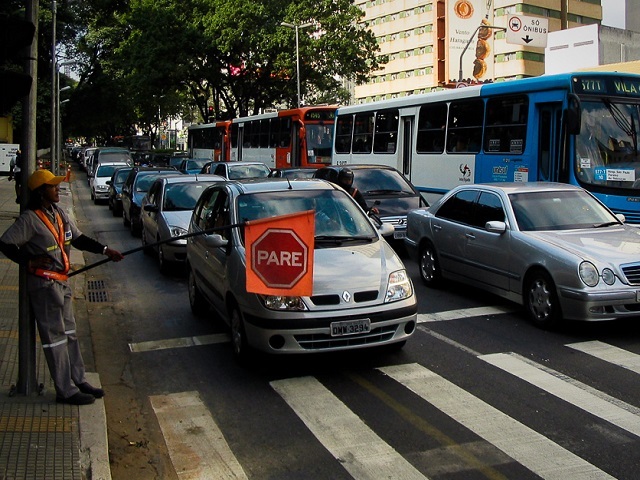 In response, some cities are implementing transport demand management (TDM) strategies to curb congestion. What cities exemplify effective TDM? Cities are places where many people and activities occur close together, so urban space is always scarce and valuable. As a result, cities must favor space-efficient modes, such as walking, cycling and public transit, over space-intensive automobile travel. There is growing appreciation of the need to limit urban automobile use. Most cities in the world are applying some TDM strategies such as more efficient parking management, complete streets policies and dedicated bus lanes, but no city is doing everything that I think is justified on efficiency and equity grounds. My research suggests if cities applied “least-cost planning” principles, and so invested in the most cost-effective transportation investments, including improvements to alternative modes and TDM programs, and if roads and parking facilities were efficiently priced, people would drive 20 – 50 percent less, rely more on walking and bicycling and public transit, and choose to live in more compact and multi-modal neighborhoods than what currently occurs. This is really good news. It shows that even in affluent countries, applying more rational policies could result in more efficient and equitable transportation system, providing large direct and indirect benefits including cost savings to households businesses and governments, traffic and parking congestion reductions, improved mobility for non-drivers, increased safety, improved public fitness and health, and reduced pollution emissions. Many people think that the solution to congestion is building new roads. Why is this myth so widespread, and how can we dispel it? Urban traffic congestion tends to maintain equilibrium, so if it gets bad enough then some travelers forego potential peak-period vehicle trips. For example, when traffic is heavy you might decide to defer a trip until later or use the subway rather than drive. As a result, when urban roadways are expanded the additional capacity is usually filled by latent demand within a few months or years so there is no reduction in congestion and overall traffic problems increase. For example, expanding freeways tends to increase surface street traffic congestion and region-wide accident rates and pollution emissions. We do know how to efficiently solve traffic congestion: provide grade-separated public transit and apply efficient road pricing so travellers have both positive and negative incentives to reduce their peak-period automobile trips. Citizens often reject these solutions. I tell people that it is fine to oppose road pricing and dedicate bus lanes, but I don’t want to hear you complain about congestion because you just chose it. Fortunately, we now have examples of successful congestion pricing and BRT programs that we can point to in order to help build support for these solutions. How can cities crate more equitable transportation systems? Walking, cycling and public transit are what you could call the “equitable” modes since they provide basic mobility to physically, economically and socially disadvantaged people. Currently, the majority of government investments in transportation facilities and services are devoted to serving automobile. In developed country cities, typically 10 – 30 percent of trips are made by walking, cycling and public transit, and something like 30 percent of the population does not drive; in developing countries these numbers are much higher. As a result, there is an equity justification to invest more in walking, cycling and public transit. Is there a relationship between public transport and gentrification? If so, what is it? I strongly advocate more affordable housing in accessible neighborhoods. I am concerned about displacement, but not about gentrification. For example, a recent study found that the Gold Line in Los Angeles resulted in more total housing units in station area neighborhoods, many occupied by more affluent households, which the author called “gentrification,” making it sound undesirable, but there was no displacement as the number of lower-income households did not decline. This is overall beneficial since this type of local economic development increases economic opportunity for lower-income residents. As cities expand and sprawl, transport becomes less efficient. What public policies contribute to urban sprawl, and what tools to do we have to counteract sprawl? A number of common market distortions contribute to sprawl, including generous minimum parking requirements in zoning codes that subsidize automobile ownership, restrictions on development density and mix, and dedicated funding for roads that cannot be shifted to improve other modes. My reports, such as “Smart Growth Policy Reforms” and “Affordable Accessible Housing in a Dynamic City” describe specific ways to create more compact, affordable and multi-modal communities. According to the World Bank, 96 percent of the globe’s urbanization by 2030 will take place in the developing world. What do you think are the lessons for rapidly growing cities? Developing countries can avoid many mistakes made by developed countries. This means that public policies should strive to create liveable cities by meeting peoples’ needs in the most efficient way. This requires adequate development densities and limits on automobile ownership in order to achieve efficiencies and minimize negative impacts such as congestion, accidents and pollution. What my research indicates is that in most cities about a third of total housing units can be single-family, a third should be townhouses, and a third multi-family, resulting in 20-60 residents per hectare, and that automobile ownership should be limited to 300-400 vehicles per thousand residents, with higher densities and lower vehicle ownership rates in central neighborhoods and in cities that are geographically constrained. Cities should have mixed development, so most common services are within convenient walking distances of most homes, and provide efficient travel options so households that want can easily be car-free. If you do want a car, that’s fine, but you should pay for the full costs of the space, risk and air pollution.